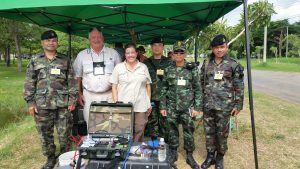 Roving Blue was demonstrated to members of the Thai Military yesterday at Fort Adisorn, a Thai military base in Saraburi, Thailand. They were not familiar with Ozone at all, but very much liked the taste aspect of the water. The MVP unit passed military bacterial water testing with flying colors.